Pancreatic cancer has the lowest survival rate among all major cancers, largely because physicians lack diagnostic tools to detect the disease in its early, treatable stages. Now, a team of investigators led by Lev T. Perelman, PhD, Director of the Center for Advanced Biomedical Imaging and Photonics at Beth Israel Deaconess Medical Center (BIDMC), has developed a promising new tool capable of distinguishing between harmless pancreatic cysts and those with malignant potential with an overall accuracy of 95 percent. The team’s preliminary data was published online in the journal Nature Biomedical Engineering. The new device uses light scattering spectroscopy (LSS) to detect the structural changes that occur in cancerous or pre-cancerous cells by bouncing light off tissues and analyzing the reflected spectrum. The results could help guide physicians’ decision making when considering whether the presence of pancreatic cysts requires surgery, a high-risk procedure. Today, because of the lack of less-invasive diagnostic methods, more than half of these procedures turn out to have been unnecessary. In Perelman and colleagues’ series of experiments, the LSS technique achieved 95 percent accuracy for identifying malignancy. Cytology — the only pre-operative test currently availably — is accurate only 58 percent of the time. 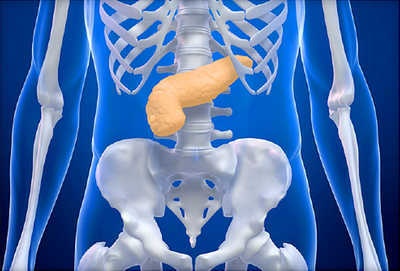 While the new technique requires further testing, LSS could represent a major advance against pancreatic cancer. Pancreatic cysts are common, and today’s high-definition scanning technologies like MRI and CT imaging are detecting them with increasing frequency. Despite their high resolution, these scanners provide doctors with limited information about cysts’ malignant potential. Currently, physicians rely on minimally-invasive fine needle aspiration (FNA) biopsies to test pancreatic cysts for malignancy. The biopsy removes fluid from the cysts, which is then analyzed for cancer cells and other telltale signs of the disease, a process called cytology. However, the test fails to detect cancer about half the time, leaving high-risk surgery as the current gold-standard means of diagnosing pancreatic cysts. To test the accuracy of the LSS system, Perelman and colleagues collected and analyzed the reflected light from 13 cysts taken from recent surgeries. Next, they compared their findings with the results from pre-operative imaging, FNA biopsies and post-operative tissues analysis. In all cases, the LSS diagnosis agreed with the post-operative analysis. In a second experiment, the LSS tool was tested in 14 patients with pancreatic cysts who were undergoing the standard FNA biopsy. Measuring less than half a millimeter in diameter, the miniature experimental LSS fiber-optic probe was inserted in the FNA needle. Physicians spent two minutes or less measuring optical spectra from the internal cyst surface before collecting fluid from the cysts as part of the traditional biopsy. Out of nine patients whose cysts had been definitely diagnosed as either cancerous or benign, all were correctly identified by LSS. Next, the researchers will assess the LSS system’s accuracy by continuing to analyze post-operative tissues as they become available. Surgical intervention after 24.5 days of acute pancreatitis may be beneficial for reducing postoperative complications. Acute pancreatitis may be an indicator for pancreatic cancer at an earlier stage, according to a study published in Medicine. Shaojun Li, M Med, and Bole Tian, PhD, from the West China Hospital in Sichuan, China, identified 47 consecutive patients with pancreatic cancer who presented with acute pancreatitis between January 2009 and November 2016. Of the patients, 35 (74.5%) were men with a mean age of 52 years. Clinical features, clinicopathologic variables, postoperative complications, and follow-up evaluations of patients were recorded from the database. 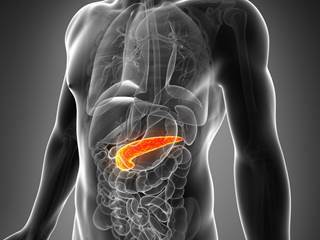 Clinical features of acute pancreatitis include abdominal pain, jaundice, and weight loss. The timing of surgery was identified by receiver operating characteristic (ROC) curve. Preoperative, intraoperative, and postoperative parameters were collected to determine operative timing of surgical intervention. Survival curves were plotted using the Kaplan—Meier method, and survival data were analyzed using the log-rank test. Of the 47 patients included, acute pancreatitis was clinically mild in 45 (95.7%) and severe in 2 (4.3%). Radical surgery was performed in 32 (68.1%) of cases, palliative surgery in 7 (14.9%), and biopsies in 8 (17.0%). A total of 2 (8.0%) patients were needed for vascular resection and reconstruction. The diagnosis of pancreatic cancer occurred at a median of 101 days, and 27 (57.4%) patients were diagnosed in less than 2 months after acute pancreatitis diagnosis. The timing of surgery was calculated from the date of the first attack of acute pancreatitis to the surgery. The best cutoff point was 24.5 days according to the ROC curve. A total of 25 (64.1%) patients received surgery at or before 24.5 days from diagnosis of pancreatic cancer. Postoperative complications occurred in 12 (30.8%) patients. The median follow-up for patients was 24 months with a patient survival rate at 1 year of 23.4%. The median survival in patients with vascular resection and reconstruction was 18 months, compared with 10 months in patients without vascular resection.